These HARROD HORTICULTURAL branded products have been designed by us and are manufactured here at our UK factory (since 1954) using the highest quality materials. We are excited to be exhibiting again at Gafa+Spoga in Cologne in 2016. We’d be delighted to welcome you there. Contact us – exporthort@harrod.uk.com for special guest tickets! We’ve a team of passionate garden product designers that are constantly innovating and bringing new ideas to the garden market. Our 60 years of UK manufacturing expertise means every product is the result of excellence in British engineering, using established and advanced new techniques for proven quality and performance. We’ve over 120,000 square feet of factory, warehouses and offices in Lowestoft, Suffolk that is located in the East of England. Everything from product design, manufacturing, administration and operations happens on site to ensure we have quality control in all that we do. With a strong brand we successfully retail our products in the UK market place and are the popular choice with both domestic and professional gardeners. Every year for the last 12 years we have had a trade exhibit at the RHS Chelsea Flower Show where we get a wonderful reaction to our product range from visitors all over the world. 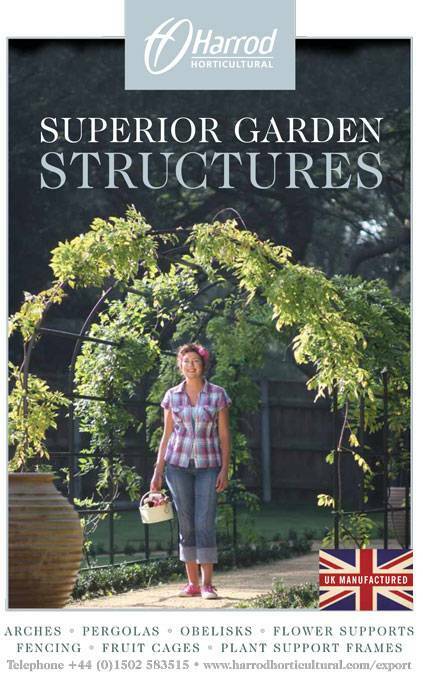 We are also proud to have our garden arch, pergola and obelisk collection endorsed by the RHS (Royal Horticultural Society), a strong recognition that our products are of the highest standard.